We’ll talk about another “Let go” case. I often hear the expression “let go”, “letting go”, or “let it go” and always wonder how it can be translated into Japanese. Same as “Yummy” in Day 12, I know how to interpret the phrase in my mind. However, I feel this expression can be translated to Japanese in various ways depending on the context. （Day 23 is not the power yoga you are used to.） Rather, this sequence invites us to find power and strength through acceptance, forgiveness and letting go. I love the Youtube channel, Yoga with Adriene. After finding her program online, I have been practicing with her via iPad for months! Yoga is one of my passions as it has enlightened my life in many and daily moments. Yoga For Bedtime – YUMMY sleepy time yoga. This gentle practice is a great remedy to anyone feeling stress, anxiety or tension in the mind or body. Use this relaxation practice to decompress, prepare for a good nights rest or simply use this yoga sequence any time of day to remedy imbalance. Put on something comfy. Bookmark this video. Yoga to the rescue! Enjoy. 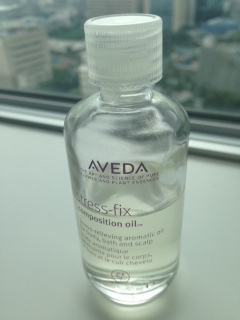 I use this product, Aveda stress-fix composition oil. It was a reward gift for points I earned shopping in the U.S. Aveda. The fact that they sent me the gift from Aveda London to Tokyo where I live, makes me believe they care about their customers. Soften your stressed skin with this nourishing aromatic oil for body, bath and scalp. Enriched with the Reine Blanche Complex, made with natural botanical derivatives, its gentle formula is designed to lighten the skin, even out the complexion and refine skin texture, leaving the skin hydrated, luminous and smooth. Reine Blanche, one of the collections by L’OCCITANE, is not sold in the U.S. which is why I was thrilled to learn about the product when I came back to Japan after years living in the U.S. In Japan, one of the important aspects many Japanese women pay attention to in skin care is the “illuminating” or “whitening” of their skin, while in the U.S. having whiter skin is not something respected so much, although supple and even-tone skin can be considered good. The concept of having healthy skin seems to be different in Japan and U.S., which has been one of the topics I have been interested in digging into. Anyway, Reine Blanche, which claims to illuminate skin is not sold in the U.S. maybe due to the reason above. So I got today’s source text from L’OCCITANE Malaysia’s website! The alcohol-free Illuminating Toner prepares the skin to revive its radiance and translucency. It is also the first step for thirst quenching moisturization that completes the expert actions of the Reine Blanche Illuminating program. Hydrating body lotion with aroma proven to reduce feelings of stress. Aroma includes essences of lavender, lavandin and clary sage from organic farms and is formulated using the science of aromaology™ and the power of pure essential oils. This is the continuation from Day 5 and 6. This is the continuation from yesterday. Kia and the NBA are honoring Lillard for his commitment to anti-bullying and his ongoing support of local, regional and national organizations that share his passion for promoting respect for all. He teamed up with Les Schwab and adidas to help the Trail Blazers tip off the “Respect, Pass It On.” campaign on March 4, which encourages people to take a stand against bullying and pledge to respect others. The Respect campaign also encourages people to make an anti-bullying pledge online at trailblazers.com/respect, which has resulted in more than 5,000 pledges to date. Damien Lillard is one of my absolute favorite NBA players. Not only is he cool and super exciting to watch on the court, but also he is supportive to others and communities. I bet he has brought joy and excitement to hundreds of thousands of fans and I cannot help but respect him as a player and a human-being. Go Portland Trail Blazers!